Under normal circumstances I choose fruit and vegetable varieties for their taste, and taste alone. This year I decided to grow a giant pumpkin, so I paid out for some Paton Twins Giant pumpkin seeds to see if I could grow a monster. Well, here is the latest update! Just 3 weeks ago on 6th August it was just half an inch across! Look at it now. I can almost see it growing right before my own eyes. How I am going to lift it to weigh it, or even get it harvested is going to be impossible. Even now I am unable to lift it!! A trip to the fruit orchard at RHS Wisley is one of my favourite places to be in the world. Unusual and forgotten varieties of fruit that take your breath away. Just look at these small pears! Fantastic. Or how about a giant, red crab apple? Many different crab apple varieties are often planted at the end of a row of trees in an orchard because they help with pollination of the eating apples in Spring. Many of these apples were just so fruitful, so fecund, so heavily laden with fruit it was incredible. I am beginning to think now that my poor crop of Bramley apples was probably due to very wet, rainy weather just at the time when the blossoms were out and there were no bees to pollinate them. An interesting corner of the orchard was a completely organic, no spray section where rows of wild flowers were planted in between the rows of trees in order to encourage beneficial insects which eat the pests. Hundreds of varieties of apples that you could not imagine! Spectacular! I am impressed with the number of corn cobs on each of these supersweet F1 Lapwing sweet corn plants. Three cobs on each stalk is quite amazing. You can tell when the tassles on the top of the corn turn brown that the kernels are starting to ripen. A little delve through the leaves will confirm that they are ripe and ready to eat. I do have a slight problem with these cobs. Years of plant breeding have aimed to produce a super, supersweet, tender sweet corn. After eating these freshly picked cobs this afternoon I am beginning to think that they are just too sugary and sweet for my taste. I suppose so many food products have sugar added nowadays, perhaps I am just getting old, but these really were very sweet and sugary. Not unpleasant, but more like a fruit than a vegetable. I think I might stick to another variety next year. Meanwhile back in the pumpkin jungle, this watched pot continues to boil! With sensible blogger advice I have moved it onto a wooden board so that the underside does not get soggy and eaten by slugs. The growth on this is just amazing! Meanwhile, elsewhere on the patch Leo has been scrumping apples! They say that a watched pot never boils. I've been going outside to the allotment every day to watch my pumpkin growing! It just seems to double in size every day! 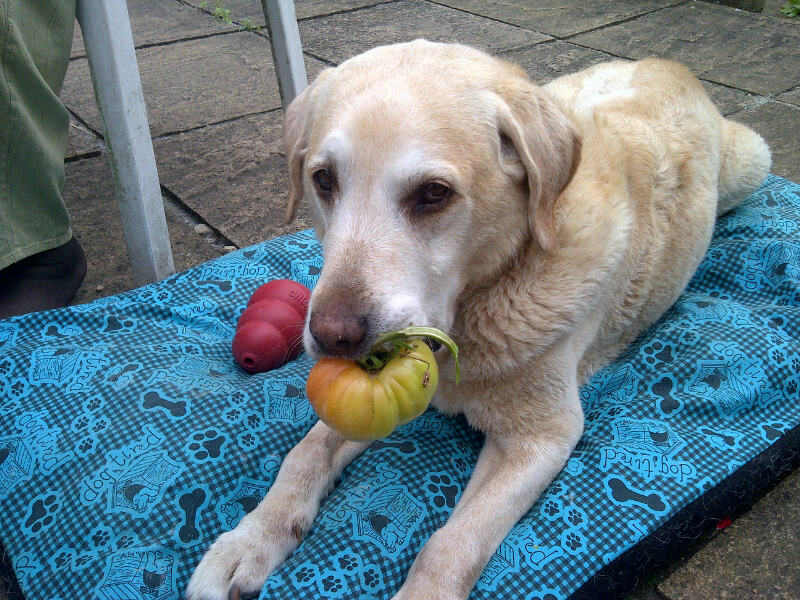 I decided to pick this Golden Jubilee tomato in the greenhouse today, in case the four legged theif gets to it before I do! A real heatwave today in London, well up in the 90s and humid too! Has anyone else had a bad year for apples? My Bramley apple tree is just awful this year. It must have been the very wet Spring and early Summer. Hardly any apples, and what little ther is are small and spotted! I thought I wasn't getting as many tomatoes this year because of the bad weather. It turns out there was a thief in the greenhouse! Caught red-handed! From marble to pingpon ball, to tennis ball, to grapefruit! My Paton Twins Giant Pumpkin is doubling in size daily! The one plant is being allowed to ramble over some spare ground. I have pinched out all the growing points and pinched off all other pumpkins so that all the plant's energy goes into the one pumpkin! My Runner Beans St George just love all this wet weather. This is a glut year for Runner Beanz! And the climbing courgette Black Forest is finally starting to crop! I just tie up the main shoot every couple of days. I am amazed at the speed of growth on this Paton Twins Giant Pumpkin. Just in a few days it has doubled in size. It does look as if my pollination attempts have been successful. The flower is fading and the fruit is swelling. In order to try to get the biggest pumpkin, I am going to cut off all but just one or two fruits on the whole plant. Elsewhere, the blackberries are starting to ripen. I see a Summer Pudding in my life in the very near future. Growing in among the pumpkin vines are these Lapwing Sweetcorn. I have not grown this variety before, but it is another of the supersweet varieties. What is different about Lapwing is that each stalk appears to have 2 or even 3 cobs! I will be very pleased if they all ripen. Mostly I just get one cob per stalk, but these look good. The Black Forest Climbing Courgette is just starting to grow properly. Not the best season at all, the weather has been really bad this season, but a few small courgettes coming along. The Sungella tomatoes are by far the most prolific variety this season, they are a stunning gold colour, but the taste is disappointing. When comparing them to a Sungold or a Chocolate Cherry variety they taste weak and insipid. Everything about this Paton Twins Giant pumpkin has giant genetics. The leaves, the vines, the rate of growth and now the flowers. This is the first and only female flower to open, the trouble is that there are no male flowers open at all to pollinate it. Female flowers are only open for a day or so and there are no male flowers ready at all. Not to miss this opportunity, I did find some male flowers from a Queensland Blue pumpkin vine that was open and covered in pollen. I am excited at the thought of having a Giant Queensland Blue pumpkin next year! Meanwhile back in the greenhouse these little Delizia cucumbers are coming along nicely. The trick with cucumbers is to pick the ripe fruit quickly so that the plant can put its energy into the next cucumber. These are a lovely size cucumber, and beautifully crisp and fresh. A bad year for tomatoes, the cool wet start to Summer has not helped the outdoor tomatoes at all. This Sungella tomato is in the greenhouse and has fared slightly better. Really quite prolific! In this case it is worth paying the extra for an F1 hybrid variety. The beautiful foliage, flowers and fruit of these Black Pearl Chillis are starting to ripen. A really stunning little chilli. Given to me last year by a kind bloggger as part of my Buddy Morris garden of black vegggies! Sweetcorn is doing fine too. It was quite slow over the cold, wet spell but now the sun and warmth is here it is growing well. I have just planted a second sowing of sweetcorn, hope they grow quickly and give me a second crop.